I love seeing teachers post their own teacher-created Desmos activities on Twitter so I decided to give it a try. I had a lesson on a worksheet that lent itself well. 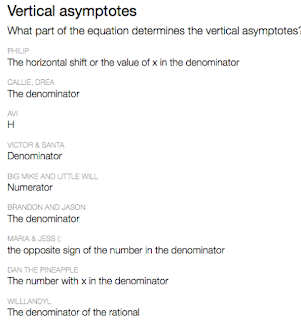 Originally, it had kids writing rationals equations on paper but using Desmos, so I made it no paper - all Desmos. I decided 16 slides would be good and it worked great time-wise. The students graphed reciprocal graphs and rational graphs as part of their homework by using the parent graph and transformations on paper the night before. It is a hard concept. So, I thought this would help them. 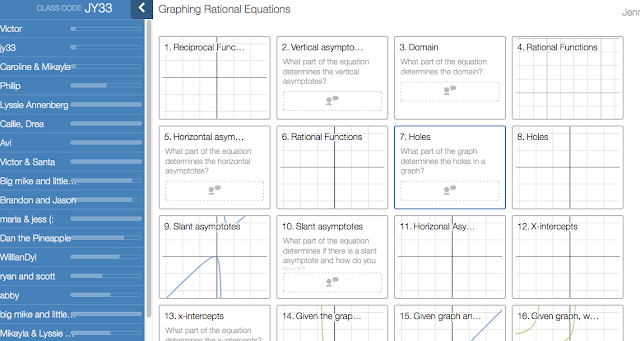 We started class with a Desmos-made activity called Polygraph. I have used it with quadratics and it is great. We did it with rationals. I gave them about 15 minutes to play each other and the class was quiet. It was great to watch their vocabulary on my teacher dashboard. They didn't want to end, but I directed them to my activity with the pin number. I also had them work on mine as 2-1 (2 kids to 1 computer). This was a good idea because they helped each other and the discussion was much richer. It jumped right in with the first slide asking them to write a reciprocal function with 3 asymptotes. 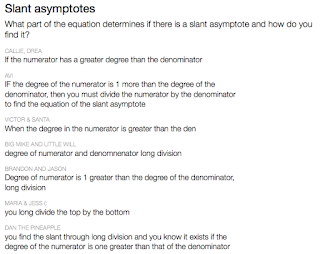 In between I asked them where in the fraction the vertical asymptotes come from, what determines the horizontal asymptotes, the holes, the slant asymptote. My 2 favorite parts were AHA moments about holes and slant asymptotes. They had a fraction that when graphed would have a hole. When they looked at the graph it looks like a solid line but when they hover at x = 2, they see the point says undefined, yeah! They said "I found the hole!" So much more powerful than on the TI calculator. And, then I gave them a function that had a slant asymptote and its graph (slant asymptote was not graphed). I asked them what it was. They did division and got the equation of the line and graphed it and voila! it checked out. Time-wise it went great. The difficulty level was good for my accelerated algebra 2 class. Here is a look at some of their work from my dashboard. I was really happy that it all went so well. The kids got a lot out of it. It led to more discussion the next day. The kids were discovering and engaged. Thanks again Desmos.